A Norfolk dancer is starring in a new contemporary ballet which features the music of the Pet Shop Boys. Aaron Sillis is one of the three main performers of The Most Incredible Thing, inspired by Hans Christian Andersen. The Sadler’s Wells’ production was given a standing ovation on its opening preview night on 17 March. ‘For a first preview I think it went really, really well,’ said Aaron, who grew up in Drayton, near Norwich. The ballet has its official premiere on Wednesday, but its first stage outing provoked an emotional response from one half of the Pet Shop Boys. ‘I saw Neil [Tennant] backstage last night and he was shedding a little tear because they’ve been working on this for three years,’ said Aaron. 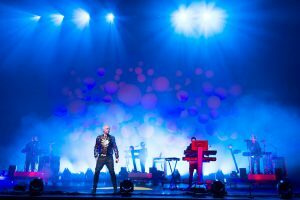 The Pet Shop Boys’ involvement in the ballet has appealed to a wide audience, with some of the duo’s fans travelling from abroad for the sellout 10-night run. ‘Last night it was a really, really mixed crowd,’ said Aaron. ‘It attracted the Sadler’s Wells’ usual crowd and then you’ve got this whole new demographic of Pet Shop Boys fans, which is so broad. ‘Some I met at the stage door had travelled from Germany and there was someone who had come over from Australia,’ he added. Aaron was asked to be in the ballet two years ago after he won a South Bank Show Breakthrough Award and said he ‘jumped at the chance’, having worked with the band before on TV shows and gigs. The Most Incredible Thing brings together a renowned team including controversial choreographer Javier De Frutos, former Royal Ballet principal Ivan Putrov and designer Katrina Lindsay. The show has been in production for 10 weeks, with Aaron describing it as a collaborative and inspiring process. Aaron, who attended Taverham High School and Norwich’s Central School of Dance, has worked as a dancer and choreographer for some top pop names including Kylie Minogue, Nicole Scherzinger and Mariah Carey. The 28-year-old was also the principal dancer in Matthew Bourne’s critically-acclaimed adaptation of Oscar Wilde’s Dorian Gray and says his latest project bridges the gap between his two worlds. ‘It’s merging both genres together,’ said Aaron. ‘I either work in theatre or I work in the pop domain and this is a bit of both. The amount of press attention that the rare commission of a three-act ballet and the Pet Shop Boys’ score has attracted means the various possibilities of UK, European and worldwide roadtrips are already being suggested. Should the show call in to Norwich it would give Aaron a chance to stay with parents Jeremy and Dianne, who still live in Drayton.